Create 2 Destroy and the Power of Outdoor Play | Daddy's in Charge? It's been many years since my boys last played with Play-Doh. Honestly, if you are like me, its fun to play with OUTSIDE but never indoors. The little balls of dough always dried up and made a mess of of the floor. I swear it's the only thing worse than crumbs in my eyes. I made the mistake when the kids were really little to let them have at it in the kitchen, but as a parent you live and learn. Take that stuff outside and save me the aggravation of having to sweep the floors more than I already do. I had almost given up on the product. My boys no longer showed an interest in it, partly from me NOT wanting them to play with it and partly that they were getting older and into a lot of other things. In fact I just threw out a complete set the other day so I could make room in a closet for my wife's Pumpkin Puree obsession. She eats so much pumpkin she has actually started to turn a little shade of orange. 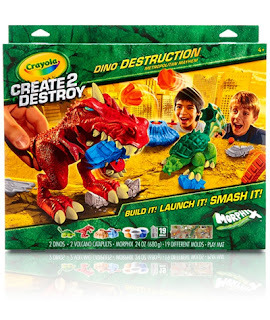 The folks at Crayola wanted to know if I would take part in a little competition amongst some other bloggers making videos on Instagram showcasing their new Create 2 Destroy product line. Me, not one to stand in the way of showcasing my kids, agreed right away. When the box came in the mail the kids were actually excited (perhaps they weren't done playing with these sort of things after all.) So outside we went. They promise that the Morphix dough won't crumble and scatter all over my kitchen, but I wasn't taking ANY chances. This is strictly an OUTSIDE toy regardless of what is promised. My kids had a little trouble with the molds of the cars and trees in the Dino Destruction Metropolitan Mayhem, but overall they enjoyed just creating bombs that they could fling at each other. Perhaps the set wasn't designed to cause World War 3, but when you get two competitive little boys that's what happens. And since we were OUTSIDE who was I to stand in the way of a good time? Now I need your help. The contest is officially underway so I need you to go and vote for me right HERE. It's very easy. Follow the steps to vote for videos and find my name "Daddy's in Charge" not the "Dad in Charge" one (unless you think his is better than mine). But as you know, I am a professional at this sort of thing. This process is NOT easy to accomplish from a mobile phone and a desktop is recommended. You guys have a chance to make your own videos with the product as well. All you have to do is follow @Crayola on Instagram and include your kids descriptive story line in the caption/ video description. Also make sure that you use the hashtag #Create2Destroy in the description as well. The winning video storyline will be featured on the 2014 Product Box. HOW COOL IS THAT? You can win your own Create 2 Destroy set by entering the contest below. I was supplied a set by Crayola and was compensated for my time and this post. All opinions are mine except when told by my wife what to think otherwise. Yes, he loves to tear it up and start all over again! They did when they were little.